Pleomorphic adenoma is a benign tumor found in lachrymal and salivary glands. It was first described by BILLROTH in 1859 as a tumor compound by an epithelial and a mesenchymal component, and it was termed a mixed tumor by MINSENN in 1874. Later on, TILLE confirmed through histological studies an association between certain kinds o orbital tumors originated in the lachrymal gland and mixed tumors of the salivary glands(1). Subsequently, WILLIS concluded that the tumor was of epithelial origin and named it "pleomorphic adenoma" in 1960. Immunohistochemical and electron microscope studies have shown that pleomorphic adenoma is of epithelial origin and its mesenchymal component is probably due to metaplasia of mioepithelial cells that form the tumor(3). Mixed tumors of the lachrymal gland often develop from accessories or main lachrymal glands, derived from epithelial structures during fissure closure(1). For this reason, they are named embriogenic carcinomas and they are frequently designated as mixed tumors for its polimorphic component. Lachrymal gland tumors are relatively rare, accounting for 5-6% of all intraorbital tumors. Pleormophic adenoma is the most common epithelial tumor of the lachrymal gland, accounting for 12% of all lachrymal gland lesions. Recurrence is high if tumor cells spread during biopsy or incomplete resection. Malignant transformation occurs in 10-20% of all tumors. Pleomorphic adenocarcinoma is the most common (75% of all malign cases), followed by adenoid cystic carcinoma (25% of all cases), but squamous cell carcinema is rare. Pleomorphic adenoma of the lacrymal gland occurs most commonly in patients in the fourth and fifth decade of life. A slow growth characterizes the tumor. 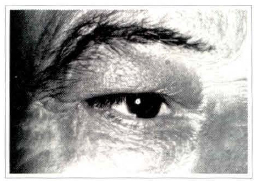 Ptosis or secondary deformities as proptosis and inferomedial displacement of the ocular globe leads the patient to look for medical help(1,4). 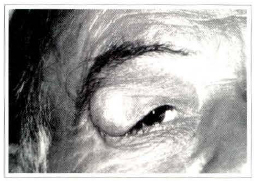 The tumor generally occupies the superolateral quadrant of the orbit, bordering the eyelid, but it may develop in any quadrant of the globe as a consequence of heterotopic lachrymal glands(1,2,4). This painless, bulk, mobile mass can lead to diplopia and exophthalmia depending on its size. 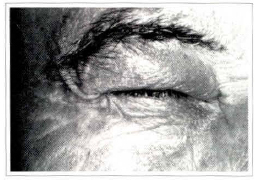 Lachrymal secretion may be diminished and ocular globe movements be impaired; adenomegalia is rare in these cases. Normally; lachrymal gland tumors should be diagnosed by clinical and radiological evidences, avoiding incisional biopsies, that are related to a higher recurrence incidence. This report describes a case of pleomorphic adenoma of the lachrymal gland, its actual approach and follow-up. A 55 year-old man visited our Plastic Surgery Division for a painless mass located in the right upper eyelid characterized by a slow and progressive growth for four years. There was no previous history of lacrimation or diplopia. This soft, painless mass measured 2 x 3 cm and caused horizontal enlargement and moderated pseudoptosis of 3 mm in the upper eyelid (fig.1). The surgical approach consisted in canthotomy, cantholysis and surgical resection of the tumoral cystic mass (fig.2), followed by horizontal shortening of the upper eyelid of 8 mm and reinsertion of a tarsal strip to the orbital rim periosteum. Fig. 1. Pleomorphic adenoma of the right lachrymal gland. Preoperative pseudoptosis and horizontal lenghtening of the upper eyelid. Fig. 2. Surgical excision including the whole tumoral capsule. 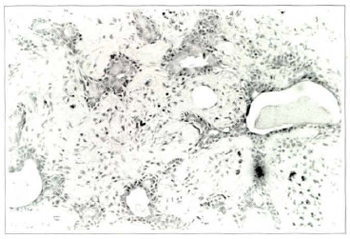 Histological examination of the surgical specimen showed a mixed tumor of the palpebral lobe of the lachrymal gland, compound by epithelial gland elements surrounded by a rich complex connective tissue with mixed cells (fig.3). The margins of the specimen were free from tumor. Based on these findings the tumor was diagnosed as pleomorphic adenoma. Fig. 3. Histological examination characterized by epithelial gland elements surrounded by a rich, complex connective tissue with mixed cells, in the lOOx magnification. Postoperative recovery was favorable and aesthetic and funcional improvent was achieved (figs, 4 and 5). Fig. 5. Postoperative aspect in occlusion. History and physical examination are essential points in the dignosis of pleomorphic adenoma of the lachtymal gland. It is first manifcstcd as a painless exophthalmos. If this condition persists for 12 mouths or more, pleomorphic adenoma should be considered(4,5). Ultrasonography, skull and orbital plain films and high-resolution CT studies are valuable diaginostic guides. Effectiveness of simple X-ray is controversial except in advanced cases or in malignization when erosin and bone destruction are visible(2). In a series of 78 patients with pleomorphic adenoma, Rose et cols., on the other hand, detected erosion of the lachrymal fossa caused by a mass in 70% of the plain films and 81% of tomographic studies. Prognosis is relatively good since the whole lachrymal gland is removed without capsular rupture(4,5). At present, incisional biopsies are avoided, and the treatment of choice consists in removal of the entire tumor including its whole capsule; otherwise, its mixed cells fall into the adjacent tissue causing recurrence of the tumor. In some specific cases where there is adherence of the tumor to the periosteum, fibrous capsule compromising and tumoral island outside the capsule, it is necessary to include the periosteum and adjacent bone. Some authors noted that preservation of the palpebral lobe of the lachrymal gland during excision reduces dry-eye and distortions in the postoperatory, improving aesthetic and functional results without jeopardizing prognosis. 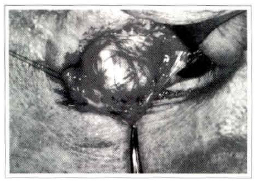 Recurrence is expected when incomplete resection of the primary lesion is done(4). Then, the tumor shows an agressive behavior, characterized by painful involvement of soft tissue in the orbitary content, and a high incidence of malignization. This phase is generally characterized by multiple surgical procedures and mutilation of the involved area, and sometimes even eye evisceration is needed(1,4). ROSE AND WRIGHT proposed a management plan with a high success rate, in which they scored eight characteristics of the tumoral mass: duration of acute symptoms, persistant pain, sensory loss, well-defined round or oval mass, moulding of mass to the globe or along the lateral orbital wall, tumor calcification, bone invasion, and duration of symptoms related to the tumor size. If the score is low (equal or less than two), carcinoma is likely, in which case biopsy is acceptable. If the score is high (equal or higher than three), pleomorphic adenoma is more likely, and excision is performed. In the present case pseudoptosis was due to the weight of the tumor exerted over the upper eyelid. There was no interference in the elevator muscle activity. The tumor excision was enough to correct the deformity. Horizontal lenghtening of the upper eyelid was due to the slow and gradual expansion of the skin, tarsus, muscle and conjuntiva caused by tumor growth. The goal for shortening of the compromised eyelid was adequate accomodation of the upper eyelid to the globe, aiming on good function for ocular protection. Once diagnosed the tumor, reduction of the risk of recurrence and malignant transformation of pleomorphic adenoma of the lachrymal gland is directly related to the complete removal of the gland, without previous biopsy(2,4,5). 1. BOUCHAYER, M. OUDOT J. - A Propos de Deux Observations de Tumeurs Mixtes Salivaires Ectopiques. J.F.O.R.L. 1970,19(3):268-272. 2. DELIRE, Y.; DEVAUX, J.; DOUNIAU, R.; PIEVEZ, C.: PETIT, P. - Tumeurs Mixtes et Cylindromes. Rev. Stomatol Chir Maxillofac 1975, 76 (2):93-108. 3. LEONCINI, P.; CINT0RINO, M.; VINDIGNI, C., LEONCINI, L.; ARMELLINI, D.; BUGNOLI, M.; SKALLI O.; GABBIANI, G. - Distribution of Cytoskeletal and Contractile Proteins in Normal and Tumour Bearing Salivary and Lacrimal Glands. Virchows Archiv A Pathol Anat Histopathol, 412:329-337. 4. ROSE, G. E.; WRIGHT, J. E.; Pleomorphic Adenoma of the Lacrimal Gland. Br. J. Ophtalmol. 1992,76:395-400. 5. TSUNODA, S.; YABUNO, T.; SAKAKI, T.; MORIMOTO, T.; HOSHIDA, T.; HIRABAYASHI, H.; TSUZUKI, T. - Pleomorphic Adenoma of the Lacrimal Gland Manifesting as Exophtalmos, in Adolescence. Neurol. Med. Chir. (Tokyo), 1994, 34:814-16. I - Assistant Professor of the Plastic Surgery Division of the Universidade de São Paulo. II - Resident of the Plastic Surgery Division of the Universidade de São Paulo. III - Head Professor of the Plastic Surgery Division of the Universidade de São Paulo. From the Plastic Surgery Division of the Universidade de São Paulo School of Medicine, São Paulo, Brazil.